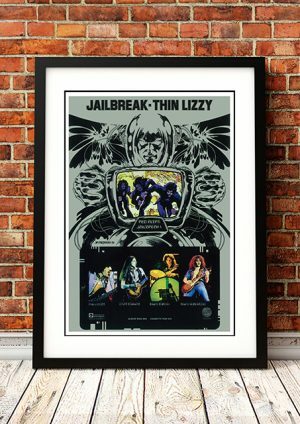 Classic Thin Lizzy Band Concert Posters and Memorabilia! Buy Online Now! Despite a huge hit single in the mid-’70s (“The Boys Are Back in Town”) and becoming a popular act with hard rock/heavy metal fans, Thin Lizzy are still, in the pantheon of ’70s rock bands, underappreciated. 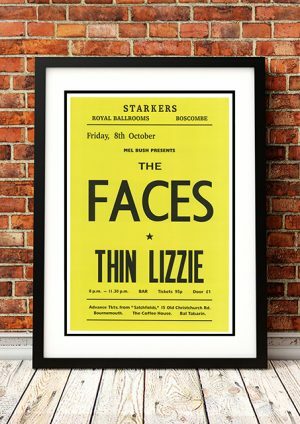 Formed in the late ’60s by Irish singer/songwriter/bassist Phil Lynott, Lizzy, though not the first band to do so, combined romanticized working-class sentiments with their ferocious, twin-lead guitar attack. As the band’s creative force, Lynott was a more insightful and intelligent writer than many of his ilk, preferring slice-of-life working-class dramas of love and hate influenced by Bob Dylan, Bruce Springsteen, and virtually all of the Irish literary tradition. Also, as a black man, Lynott was an anomaly in the nearly all-white world of hard rock, and as such imbued much of his work with a sense of alienation; he was the outsider, the romantic guy from the other side of the tracks, a self-styled poet of the lovelorn and downtrodden. His sweeping vision and writerly impulses at times gave way to pretentious songs aspiring to clichéd notions of literary significance, but Lynott‘s limitless charisma made even the most misguided moments worth hearing. 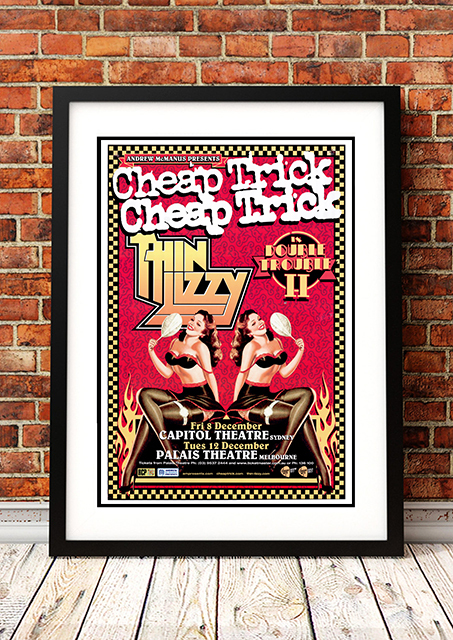 We stock some awesome Thin Lizzy Band Concert Posters.